•RivEX will fail to process a network which is not topologically correct, therefore quality controlling your river network is an important step and should not be ignored! •Some quality control tests can run very quickly whilst others will take a long time on large networks. Long run times are a result of RivEX having to test the spatial relationship of each polyline with its neighbours and sub-setting large datasets is a time consuming operation. •RivEX does not attempt to automatically fix problems, it only identifies them. The reason is simple, a problem can have more than one solution and the solution depends upon seeing the "bigger picture" which only you the user has. To allow the GIS to automatically fix errors can sometimes lead to even more problems! •After you have set the layer and workspace,the tools panel activates and you can expand the Quality Control node. •Tick Run quality control tools and then press the Run Tool button; the quality control dialog will appear. •You can select 1 or more quality control tools to run. In the example below a user has chosen to run 4 tools. You can select\clear all tools using the Select\Clear all buttons. •Click OK to run the tools. Progress is reported by RivEX in the progress panel. Any red text indicates the network failed that particular quality control tool. Follow the instructions which typically tells you to refer to an error log file. The error log file is stored in the error log folder in the datasets workspace folder. •If Open Error Log files is ticked, RivEX will automatically open any error log files created. This simply saves you from having to locate them in the workspace folder. The ramifications of editing a network. . .
•If you have identified various errors and tweaked the shape of the polyline, moved polylines, split polylines, exploded multi-part shapes and snapped everything correctly, then you will have a network ready for RivEX to process. •But . . . the problems start when other information references your old uncorrected network! •For example, you have identified a short, 2 vertex polyline and deleted it. You will have snapped the other polylines to a single node to ensure network connectivity. By snapping the lines you have moved them. 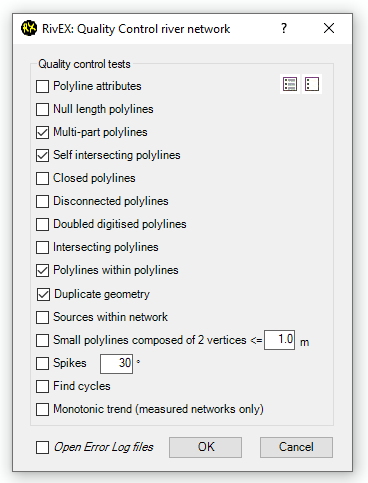 Other aligned data (which could be points, lines or polygons) representing sampling sites, GPS locations, or administrative boundaries will now either intersect or not. •Information encoded into the polyline may not be valid any more. PolylineM values will require recalibration if you have shortened a polyline by removing a vertex that was causing self-intersection. Always work from a backed up copy!